In Crimson Peak, acclaimed filmmaker Guillermo del Toro returns to the genre he helped define with a powerful blend of psychological thriller, gothic horror, and seductive romance. This deluxe book explores the creation of del Toro’s sinister masterpiece and the dark themes and motifs woven into every frame of this extraordinary film. 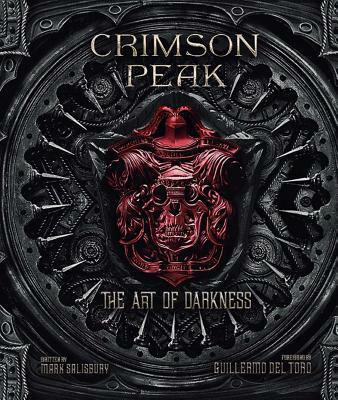 Featuring extensive interviews with the director, Crimson Peak: The Art of Darkness chronicles the creative odyssey that brought the film to screen, showing how del Toro’s unique perspective, attention to detail, and storytelling prowess were key in crafting a film of incredible visual richness and thematic power. The book also features extensive interviews with the team of artists who helped realize the world of Crimson Peak, from the film’s sumptuous period costumes to the dilapidated majesty of Allerdale Hall and the eerie red-hued ghosts that haunt the halls of “Crimson Peak.” Also featuring insights from the films stars, including Mia Wasikowska, Tom Hiddleston, Jessica Chastain, and Charlie Hunnam, Crimson Peak: The Art of Darkness explores the themes at the heart of this breathtaking supernatural mystery in unparalleled detail. Filled with striking concept art and stunning photography, the book also features a range of amazing special items, including an authentic period letter, daguerreotype photographs, biographies that reveal the secret history of Crimson Peak’s characters, a booklet that showcases the film’s amazing costume designs, and more. A thrilling journey into the macabre heart of Guillermo del Toro’s spine-chilling new tale, Crimson Peak: The Art of Darkness is the perfect companion to this gothic horror masterwork. Mark Salisbury is the author of more than a dozen books, including the critically acclaimed Tim Burton biography Burton on Burton and the best-selling “making of” books Alice in Wonderland: A Visual Companion and Prometheus: The Art of the Film. A former editor at the British movie magazine Empire, Salisbury lives in London, England.